We’d love your help. Let us know what’s wrong with this preview of La Corte de Carlos IV by Benito Pérez Galdós. To ask other readers questions about La Corte de Carlos IV, please sign up. This is the second volume in the First Series of the National Episodes and I found it utterly fascinating. It came as a surprise to discover its multifaceted nature. 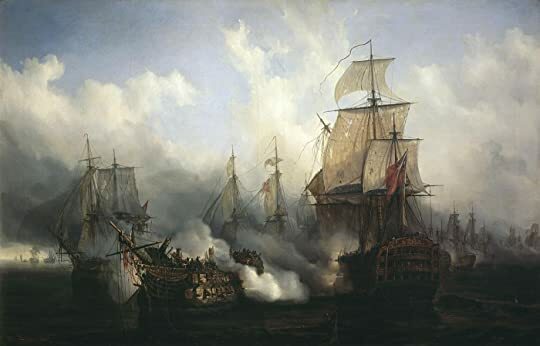 In the previous and first book in the series we met our protagonist, the young Gabriel de Araceli, as a direct witness and eventual participant in the Battle of Trafalgar in 1805. At the end of the narration the disgruntled Gabriel decided to leave Cadiz and go to Madrid. In the second book we meet Gabriel over a year later, by now aged 16, and already settled in the capital where he has found work as a sort of assistant to an actress, Pepita González. As part of the political thread that these Episodes trace, we enter the Royal Court and are about to observe what has been called the "Escorial Conspiracy" (Proceso de El Escorial). As a consequence of Spain having joined Napoleon's "Third Coalition" (hence its participation in the Trafalgar battle), the disaster resulted in an acerbic enmity between the Secretary of State, Manuel Godoy (1767-1851), and the Crown Prince, Fernando (later Fernando VII) (view spoiler)[on the left dressed in blue in the painting above (hide spoiler)]. In the Escorial scheme Fernando leading a group of nobles intended to oust Godoy. The planned coup was discovered on the 27th of October 1807, the same day the "Treaty of Fontainebleau" had been signed by Godoy and Napoleon. In this agreement they agreed to invade Portugal together and divide the country in three: the north would go to Fernando's nephew, Carlos II of Parma and King of Etruria (1799-1883); the centre would be kept by Napoleon himself for further political dealings; while the south, converted into Principality, would be delivered to Godoy. We are then, with our Gabriel--object and candid subject of the various palace intrigues--, in the very corridors of the Escorial palace and look on as the Prince is caught and led to his captivity. For Fernando's crime was not solely against the Secretary; it had the aggravation of a lèse-majesté as it contravened directly the orders of the King his father. It is not necessary to be blind to understand that Napoleon does not say what he thinks? This man has not stirred up all the parts of the world; he has not removed the kings from the thrones he has wanted but to place there his brothers, the brats. ¿No es preciso estar ciego para comprender que Napoleón no dice lo que tiene pensado? Este hombre no ha revuelto todas las partes del mundo; no ha quitado de los tronos a los reyes que ha querido para poner a los mocosos de sus hermanos. Wisdom coming out of the popular voices. Raders have proposed that Galdós's account of the controversial way in which the locals viewed Napoleon before the country was invaded is comparable to Tolstoy's War and Peace (W&P). This notion invited me to google around, assuming that the Russian novel would have inspired Galdós, but soon realized that this could not have been so. It was too recent. 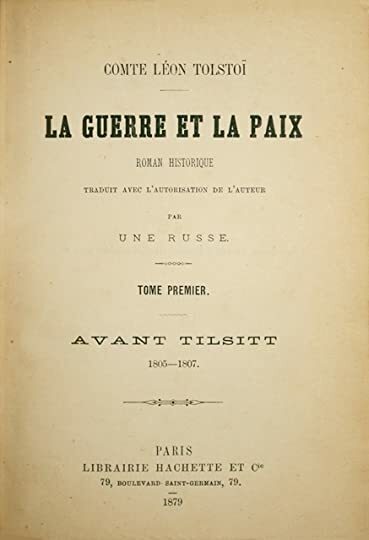 W&P was published in Russia in 1863, but the first translation, into French came in 1879 (with the 'authorization' of the writer, who died in 1912); from the French it was rendered into English in 1885. Not that Galdós did not read Tolstoy. His library contained fifteen Russian novels including the French edition of W&P from Hachette in 1886. 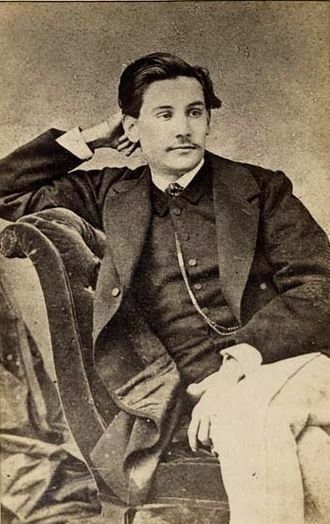 But Galdós's published his work in 1873, years before the Russian novel was first translated. Apart from dates, and possible indebtedness, this novel differs from W&P in that we get the view not only of the nobility, but also of the very popular classes. We enter the plot through the young Gabriel, a figure that relates Galdós's work with the very strong literary tradition in Spain of the 'picaresque' novel (La vida del Lazarillo de Tormes; Guzmán de Alfarache I; El Buscón). 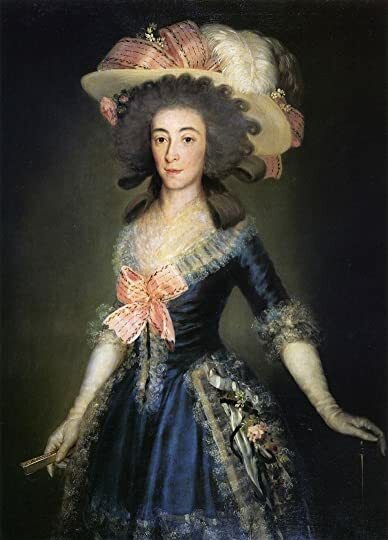 This array of social classes, apart from literary precedents, was possibly unavoidable because at that time the Spanish nobility loved to dress up and disguise and mingle with the lower strata of society. 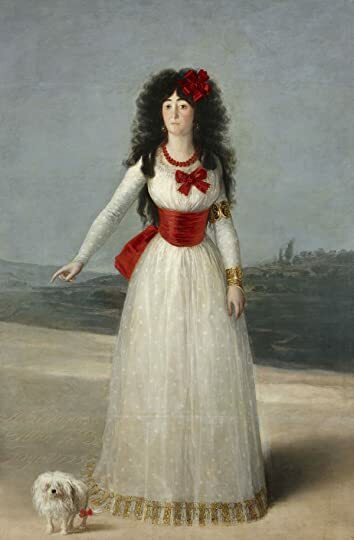 They were the Majas and Majos whose looks have been immortalized by Francisco de Goya, (1746-1828). 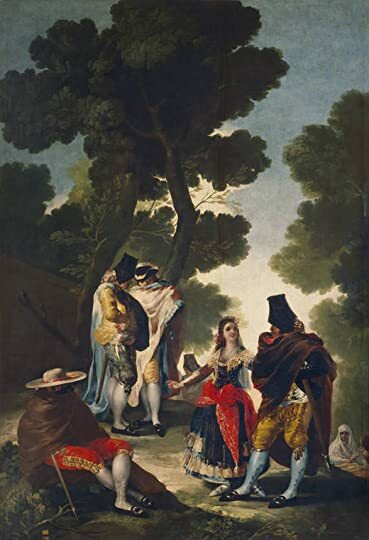 It is conceivable that this book may be if not the source then a support for the fabrication that the Duchess of Alba, also rumoured to have had an affair with Goya, was the model for the Naked Maja (painting in reality commissioned by Godoy and of an unknown woman). This happened at a time when we were making clandestine excursions outside the Palace, when Amaranta insisted that Goya portray her naked. Esto pasó en una época en que hacíamos excursiones clandestinas fuera de Palacio, cuando Amaranta se empeñó en que Goya la retratase desnuda. For another attractive part of reading this novel for me has been to meet Goya and his depictions at the turn of every page or opening of any palace door. The descriptions of the nobles and members of the royal family were the visual images that Galdós converted into textual ones. His presence as visual recorder is so strong that his somewhat elusive appearance in the novel as one of the as a characters does not make the reader shift uneasily in his/her seat. From the title of the novel, eponymous with his royal portrait, and heading this review, we feel we are in Goya's world. Apart from the political and social and pictorial scenarios, Galdós has portrayed also the literary stage in Spain during this time. Right at the beginning of the novel, Gabriel finds himself in the band that attacks the plays of the neoclassical Leandro Fernández de Moratín, a friend of Goya's, and we assist, with Gabriel, to the opening night, on the 24th of January in 1806, of the epochal El Sí De Las Niñas. But similarly to the way Gabriel, in the Trafalgar episode, came to realize that the patriotism of the victorious English was as natural as his, in this theatrical episode, although he is there to boo and boycott the play following the instructions of his patrons, he eventually acknowledges that the play has three beautiful episodes, and expands eloquently on these. In this tangential praise of Moratín, we can easily guess then the opinion that Galdós, who had started out as a Romantic writer, had of the 'iluminado' writer. Galdós’s interest in the theatre is also shown in the very theatricality of the novel. Many scenes are constructed as if on the stage, culminating in the dénouement in which a Spanish version of Shakespeare’s Othello is enacted on a doubly fictionalized level: the characters represent that play, but they also act on their own lives a superimposed parallel Othello version. As this was a great enjoyment I look forward to the next Episodio. It's possible that some of you know that Cervantes is my favorite author, but over the years, Galdós has been gaining in ranking. Now I would say the #1 position is shared between these two. Benito Pérez Galdós was born in Las Palmas de Gran Canaria, and his mom sent him to Madrid to study law. He read and admired Dickens, Balzac, and Tolstoy, and he's been called our Spanish own equal to no less than the three of them. He was a very prolific writer. He had many interests in life, and the variet It's possible that some of you know that Cervantes is my favorite author, but over the years, Galdós has been gaining in ranking. Now I would say the #1 position is shared between these two. Dialogues and humor are salient qualities in his books. He captures the voice of the people like no other. He used to take endless train trips, just to listen to how people from all breeds of society talked. He's said to have had a wonderful memory. My favorite of his skills as a writer are numerous: his treatment of minor characters, (all those with a short appearance are unforgettable), his ability to capture an ambiance, (through deft strokes, he paints landscapes, people, and events that pop up from the pages). His tenderness and attention to details make the story gain great momentum, (clothing, food, death, illness, markets, all those make his books lively and delightful), his genius to give you the different views of a conflict, -whether political, sentimental, or the clash of classes, he never ceases to impress. La corte de Carlos IV, is the second of his 46 Episodios Nacionales. There's 5 series, each meant to have 10 books, but the last one, series 5, he couldn't complete, thus having only 5 books and a draft. You can find many free for Kindle or ebook, and there's even some at Librivox in audio format as well as ebook. Each series has a main character, and Gabriel de Araceli, is the one in these ten. In Trafalgar, he was a lad of just 15 years. In this one, he was only a year older, 16. There's a few memorable occasions in which Gabriel addresses us, the readers, with his own thoughts, making the book not just historical novel, but also a coming of age for him. I'm looking forward to following Gabriel in the other 8 books in his series. While not all these Episodios are translated into English, some are, along with many other of his titles. I understand this post is for a minority, (though Galdós has always been and will always be read by many of us who can read in Spanish. For those of you who read in English, you have Walter Scott, Dickens, Trollope, Thackeray, George Eliot, Wilkie Collins, and many more Victorian writers that compete for our personal devotion. As if that weren't enough, we have the French and the Russian available to us, if not in original language, in translation. The great news it's that we all have a different end of the yarn to pick and unravel the wonderful net of history, culture, literature, and heritage that the XIX century has so generously gifted us through these titans. Muy entretenido e instructivo. Curiosamente, y de forma contraria a lo que pensaba, me ha gustado más la parte histórica que la de ficción. Lo que más me ha interesado ha sido conocer mejor el mundillo teatral de la época. Cuesta entrar en la novela, de hecho, creo que hoy en día sería complicado que la publicaran ya que la acción realmente empieza en el Capítulo X, por lo que a los lectores impacientes que tanto abundan puede atragantárseles. Hasta ese capítulo X, Galdós nos muestra cómo era la España de la época, sobre todo el mundo del teatro y los comediantes, a través de los ojos de Gabrielillo, algo más crecido ya que en Trafalgar. Los retratos costumbristas y las anécdotas relacionadas con autores y represe Cuesta entrar en la novela, de hecho, creo que hoy en día sería complicado que la publicaran ya que la acción realmente empieza en el Capítulo X, por lo que a los lectores impacientes que tanto abundan puede atragantárseles. Hasta ese capítulo X, Galdós nos muestra cómo era la España de la época, sobre todo el mundo del teatro y los comediantes, a través de los ojos de Gabrielillo, algo más crecido ya que en Trafalgar. 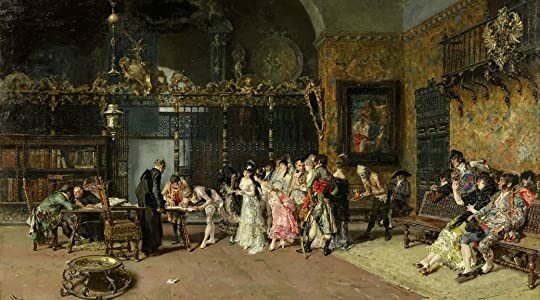 Los retratos costumbristas y las anécdotas relacionadas con autores y representaciones de la época son muy buenos, como siempre en Galdos, pero a veces en esos primeros capítulos parece más un ensayo que una novela. A partir de ese capítulo X, la historia va tomando forma y del XVII en adelante se vuelve apasionante, haciéndonos testigo de las intrigas palaciegas en la Corte de Carlos IV, la visión del pueblo llano respecto al monarca, su mujer y sus líos con Godoy, la conspiración de Fernando contra sus padres, y en algunos pasajes da mucho que pensar sobre nuestros políticos actuales, no tan distintos a los de entonces. A la trama política, se le une la amorosa, con historias de enredos entre cortesanas, actores, soldados y nobles, que ponen de manifiesto también la hipocresía moral de la época. El libro tiene una gran carga moral y de crítica social, y sin ser un libro de historia, acerca a los hechos de una forma honesta. En este segundo episodio volvemos a encontrarnos con Gabriel de Araceli, protagonista de Trafalgar y en esta ocasión, podemos vislumbrar cómo era la vida en la corte del rey Carlos IV, con sus intrigas y bajas pasiones y sobre todo en el mundo del teatro de aquella época. Esta incursión en la esfera de actores y dramaturgos le sirve a Galdós de vehículo para contarnos los acontecimientos que desembocaron en el llamado "Proceso de El Escorial", una conspiración urdida por el príncipe Fernando y su En este segundo episodio volvemos a encontrarnos con Gabriel de Araceli, protagonista de Trafalgar y en esta ocasión, podemos vislumbrar cómo era la vida en la corte del rey Carlos IV, con sus intrigas y bajas pasiones y sobre todo en el mundo del teatro de aquella época. Esta incursión en la esfera de actores y dramaturgos le sirve a Galdós de vehículo para contarnos los acontecimientos que desembocaron en el llamado "Proceso de El Escorial", una conspiración urdida por el príncipe Fernando y sus partidarios para destronar a los Reyes y alzarle a él al trono. La novela tiene un ritmo rápido a pesar de que prácticamente no ocurre nada hasta bien pasada la mitad, las descripciones y retratos de los personajes son fascinantes y minuciosos como siempre en Galdós y la mezcla entre las intrigas cortesanas y el drama teatral (Otello) le da un toque original a la obra. Así como el primer Episodio Nacional (Trafalgar) es una novela de aventuras, este tiene una trama mucho más elaborada, mezclando rasgos de una novela de misterio e intrigas con alguno que otro de picaresca. Todos los detalles de la trama tienen su relevancia en un final sorprendente y magistral. La evolución del protagonista, Gabriel de Araceli, es impresionante. Galdós consigue que al mismo tiempo Gabriel se haga más astuto e ingenioso sin por ello renunciar a sus sueños infantiles Obra maestra. La evolución del protagonista, Gabriel de Araceli, es impresionante. Galdós consigue que al mismo tiempo Gabriel se haga más astuto e ingenioso sin por ello renunciar a sus sueños infantiles y a su sincero honor. Han pasado dos años desde el episodio de Trafalgar y ya tenemos a Gabrielillo hecho todo un moz en Madrid trabajando al servicio de una actriz. Es la época del estreno de "El sí de las niñas" y del intento de golpe de estado del príncipe Fernando. Este libro sí que me ha entusiasmado. Me ha parecido mucho más trabajado que "Trafalgar" en cuanto a la estructura argumental. Con toques de folletín y un afilado sentido del humor. La última parte donde se mezcla la representación de la obra "Otelo" co Han pasado dos años desde el episodio de Trafalgar y ya tenemos a Gabrielillo hecho todo un moz en Madrid trabajando al servicio de una actriz. Es la época del estreno de "El sí de las niñas" y del intento de golpe de estado del príncipe Fernando. Este libro sí que me ha entusiasmado. Me ha parecido mucho más trabajado que "Trafalgar" en cuanto a la estructura argumental. Con toques de folletín y un afilado sentido del humor. La última parte donde se mezcla la representación de la obra "Otelo" con la trama es fantástica. 3.5 más bien. Me ha gustado bastante esta primera inmersión en Galdós que me llegó un poco de casualidad, aunque hay cosillas que se hacen pesadas. Much less fluid than the first instalment of the series "Trafalgar", this second 'episode' continues the contrivance of using the young lad Gabriel to offer a glimpse into historical events while at the same time creating a somewhat theatrical drama. The historical backdrop has two focal points a) The Conspiracy of el Escorial in 1807 when the young Prince of Asturias and future Fernando VII colludes to dethrone his parents and remove Godoy as the de facto ruler while stupidly seeking the help Much less fluid than the first instalment of the series "Trafalgar", this second 'episode' continues the contrivance of using the young lad Gabriel to offer a glimpse into historical events while at the same time creating a somewhat theatrical drama. The historical backdrop has two focal points a) The Conspiracy of el Escorial in 1807 when the young Prince of Asturias and future Fernando VII colludes to dethrone his parents and remove Godoy as the de facto ruler while stupidly seeking the help of Napoleon in this scheme. b) On the cultural realm, the clash between the old baroque theatre with its exaggerated declamations and exotic or mythological scenarios and the new theatre with its neoclassical rules and unities of time and space represented by Leandro Fernandez de Moratin. 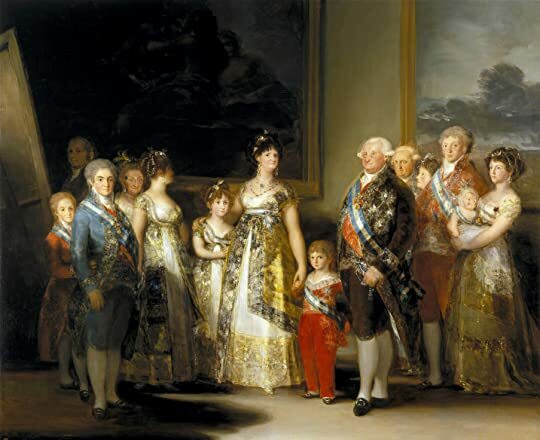 Special mention deserves the observation of how the Spanish nobility liked to enjoy itself among the populace by dressing the part and leaving the boring soirees to mingle with the filthy masses, a habit much portrayed by the great painter of the time, Goya. In order to display both environments, Galdos moves his character to become successively an apprentice at a printing shop, a servant to a famous actress, a servant in court to a lady of rank and finally, when his sense of honour finally allows him to escape the vicious and blinding ensnaring of court intrigue, a young apprentice again. Without a doubt, it is in the area of the theatre world with its hungry authors, paid hecklers and jealous actors where this novel shines with humour and Dickensian relish in the portrayal of the customs and colour of this micro-cosmos. May be due to the fact that these episodes were released to the public in instalments, some parts become repetitive. For example, the character of Gabriel seems very keen is ascending the social ladder . Many times he tells himself that he is no less deserving than the many individuals favored by one or another courtier that reached posts of importance. 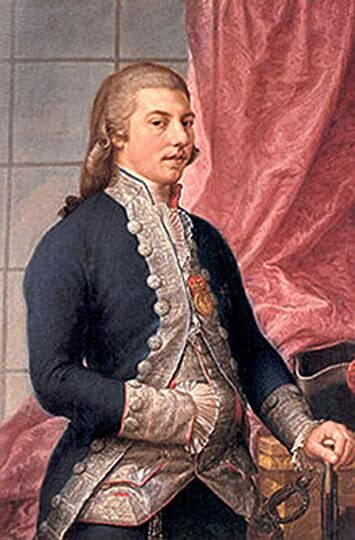 This was, in fact, the case in the times of Carlos IV when characters like the Ministers Godoy and Caballero ascended to dizzying heights of power with no other merit than intrigue and manipulation. It is also a bit tiresome how all women are described as beyond compare or thereabouts. Galdos is sometimes heavy-handed when pointing out contrasts between 1) the superficial beauty of courtesans and the humble but true beauty of Ines (Gabriels beleaguered seamstress girlfriend) 2) The true goodness, loyalty and humility of Ines' family, worlds apart form the self-interest of court relationships 3) The deep political intuition of Gabriel's blacksmith friend 'Chispitas' against the fallacies of self-appointed diplomats 4) Gabriel's true sense of honor in contrast with the honor bestowed by social status alone. 5) The ignorance of the mob against the wilful treachery of the government. Livro excelente. Boa história, muito bons personagens e uma narrativa e estrutura perfeitas. Galdos é um mestre consumado da arte de escrever e contar histórias. Há uma ou duas passagens de coincidência um tanto forçada, mas que a meu ver não comprometeram. Muito diferente de Trafalgar, "La Corte..." não é um livro de aventuras, senão que está cheio de política de Madri e intrigas palacianas no Escorial. Porém sobretudo está presente a natureza humana em traços incrivelmente verossímeis. Um must- Livro excelente. Boa história, muito bons personagens e uma narrativa e estrutura perfeitas. Galdos é um mestre consumado da arte de escrever e contar histórias. Há uma ou duas passagens de coincidência um tanto forçada, mas que a meu ver não comprometeram. En este segundo libro de los Episodios Nacionales Galdós sitúa al protagonista en el Madrid de Carlos IV como criado de una actriz primero y de una condesa más tarde para descubrir una serie de intrigas palaciegas en los albores de la invasión napoleónica. Me ha resultado bastante más interesante que Trafalgar, el primero de los Episodios. En mi opinión una gran novela que combina con gran habilidad historia y ficción, es verdad que empieza algo lenta la trama pero en ningún momento se me hizo pesada. Cada vez le estoy cogiendo más cariño al protagonista a lo largo de los episodios. Sin duda me ha animado a seguir leyendo los episodios nacionales. Segundo libro de los Episodios Nacionales. Galdós sigue contando las aventuras de Gabriel esta vez en Madrid. Entre la servidumbre, el teatro y las intrigas de Palacio se desarrolla la historia. En mi opinión más flojo que el primero, pero aún así lo he disfrutado mucho. Me gustó bastante. No son aventuras y batallas épicas como en Trafalgar, pero refleja bastante bien la época y la trama me pareció escepcional con un final a gran altura. Sáltatela, no aporta nada y todo es muy lento. El bueno de Benito nos trae una historia cortesana. Este hombre es un genio contando batallas y hazañas bélicas, pero en cuanto se mete entre cuatro paredes no puedo con él. En esta ocasión nos cuenta la historia de Araceli, el mismo de Trafalgar, metido en medio de una conjura palaciega. Benito nos cuenta cómo sucede la conjura, la investigación y los juicios. Además nos introduce las relaciones sociales en la corte, que nos continuará en novelas pos Sáltatela, no aporta nada y todo es muy lento. Benito nos cuenta cómo sucede la conjura, la investigación y los juicios. Además nos introduce las relaciones sociales en la corte, que nos continuará en novelas posteriores. Realmente no es una mala novela para ser de cuando es. A día de hoy es otro cantar. Comienza muy lenta y no hay nada de chicha hasta más allá de la mitad. La acción, si es que hay alguna, del principio está descansa en el pilar del cotilleo y el compadreo. Sé, imagino, creo, que lo usa para hacer una crítica de lo que no debería ser una corte, y no lo hace mal. Pero, dios, qué aburrido. Si te vas a enfrentar a los Episodios Nacionales déjate este de lado. Sigue con el siguiente, porque no vas a echar de menos ninguna información contenida en él. Además, los lomos inmaculados adornan mejor la estantería. Galdós nos sitúa en pleno gobierno de Godoy, momento en el que Napoleón estaba pensando en conquistar el país y el príncipe Fernando intrigaba para derrocar a su padre. Entre todos estos líos políticos, el autor nos muestra la opinión del pueblo, los rumores que se oyen en las calles, acercándonos a lo que se vivía en aquellos tiempos, que en ocasiones no parece tan diferente a la actualidad. El ritmo de lectura es ascendente, es ligeramente lento al principio, el final es bastante rápido, y te d Galdós nos sitúa en pleno gobierno de Godoy, momento en el que Napoleón estaba pensando en conquistar el país y el príncipe Fernando intrigaba para derrocar a su padre. Entre todos estos líos políticos, el autor nos muestra la opinión del pueblo, los rumores que se oyen en las calles, acercándonos a lo que se vivía en aquellos tiempos, que en ocasiones no parece tan diferente a la actualidad. El ritmo de lectura es ascendente, es ligeramente lento al principio, el final es bastante rápido, y te deja con ganas de leer el siguiente y conocer las próximas aventuras de Gabriel. 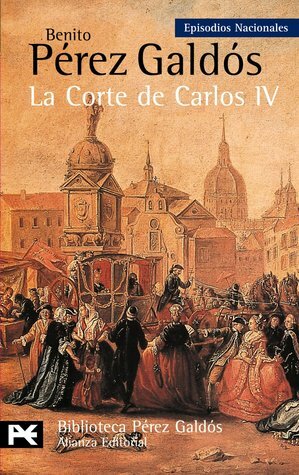 La corte de Carlos IV es un libro bonito, narrado con un toque de humor, con guiños a diferentes autores de teatro de la época, en definitiva es una novela muy completa. Utiliza Galdós la figura de un mozo, Gabriel de Araceli, que llega a Madrid para buscar trabajo y a través de sus andanzas cuenta como era la corte en los tiempos de Carlos IV. La forma en que está escrito tiene un tinte muy costumbrista y hace una interpretación de la historia un poco en plan cotilleo. Relaciona los grandes de la corte con el teatro, las actrices y no escapa nadie cuando retrata a Condes, Duques y demás metidos en sus intrigas personales. Interesante, facil de leer, pero mas que Utiliza Galdós la figura de un mozo, Gabriel de Araceli, que llega a Madrid para buscar trabajo y a través de sus andanzas cuenta como era la corte en los tiempos de Carlos IV. Interesante, facil de leer, pero mas que una novela de historia utiliza esta para contar como funcionaba la corte a través de las miserias y grandezas de sus protagonistas. This review has been hidden because it contains spoilers. To view it, click here. En Madrid, Gabriel tiene ocasión de pasar unos días sirviendo en la corte, pero escapa al darse cuenta de que para prosperar allí no hay otro camino que perder el honor. La madre de Inés, el amor de Gabriel, se muere, pero se descubre que Inés fue la hija ilegítima de la duquesa de Alba. El trasfondo de la sociedad literaria y de teatro da color a este episodio, y el clímax durante la representación de Othello está muy conseguido. Al principio le ha costado arrancar y me ha resultado un poco tedioso todo lo del mundillo del teatro. Pero luego está muy bien, las intrigas, los celos, los enredos, es como un boudeville. En menudos líos se mete el iluso Gabrielillo, al final aprende. Y casi, sin querer, nos explica los tejemanejes políticos del momento y el ambiente de la calle. Muy bueno. Menys dinàmic però més didàctic que el primer dels "episodios nacionales" (Trafalgar), és un retrat polièdric i brillant del Madrid de finals del segle XIX (polític, social y cultural). Un Madrid (o una Espanya si considerem el conjunt des d'un punt de vista castellanocentrista), que poc o gens ha canviat d'ençà. Segundo libro de la primera serie de los Episodios Nacionales. El protagonista de la historia se encuentra en Madrid al servicio de una actriz y temporalmente al de una condesa de la corte de Carlos IV donde es testigo de la conspiración de El Escorial. Libro que remonta ligeramente el nivel del anterior teniendo como centro al famosísimo actor de la época: el cartagenero Isidoro Máiquez. nos sumerge en una época històrica complicada y poco conocida por los espańoles. 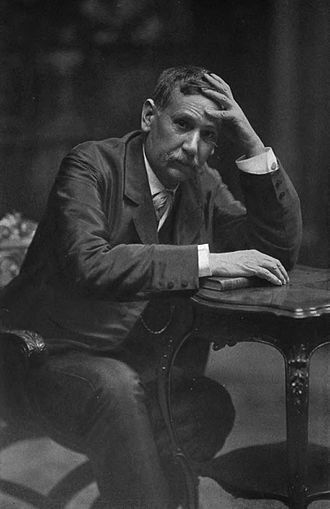 Galdós was a prolific writer, publishing 31 novels, 46 Episodios Nacionales (National Episodes), 23 plays, and the equivalent of 20 volumes of shorter fiction, journalis Benito Pérez Galdós (May 10, 1843 – January 4, 1920) was a Spanish realist novelist. Some authorities consider him second only to Cervantes in stature as a Spanish novelist. He was the leading literary figure in 19th century Spain.